A quick guide to the most popular animal symbols and their meaning. Click on the symbols below or on the links to the left. Animal symbols are world wide unique collections that unconsciously belong to the world of myths, traditions and religious cultures around the globe. These animal symbols in themselves contain secret meaning that are revealed through oral traditions or written texts about them and they are mostly related to specific characteristics of the animals they represent. These characteristics are those that can be observed by anybody depending on the nature of the animal symbol used. The exclusive meanings we provide in these animal symbols can widely be understood in the recent future by looking at them in their cultural or historic context. When an individual is able to understand the animal symbol in this context they will be able to find the hidden meaning through different figurative expressions used by different people around all cultures including when the animal symbols are used in films, poems, proverbs, art and even novels and advertisements. 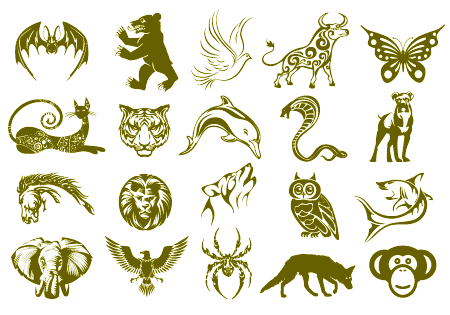 Browse here to find the perfect animal symbolic meaning for your personal tattoos, club banners, business logo, organizational symbols, company flags etc.